Dr. Umasankar Saha, M. Com., L.L.B., M. Phil., Ph. D., Associate Professor. 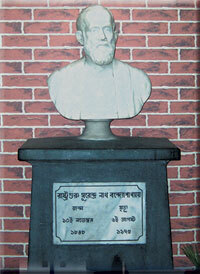 Dr. Barendranath Roy, M. Com., L.L.B., M. A.C.A., Ph. D., Associate Professor. Dr. Purna Chandra Maity, M. Com., B. Ed., M. Phil., Ph. D., Associate Professor. Prof. Amit Das, M. Com., Assistant Professor. Prof. Madhab Chandra Samanta, M.I.I., Govt. P.T.T. Prof. Shymal Kumar Pathak, M. Com., Govt. P.T.T. Prof. Maumita Kundu, M. Com. Guest Lecturer. Prof. Uday Bhanu Dhole, M. Com. Guest Lecturer. Prof. Dipankar Bera, M. Com. Guest Lecturer.